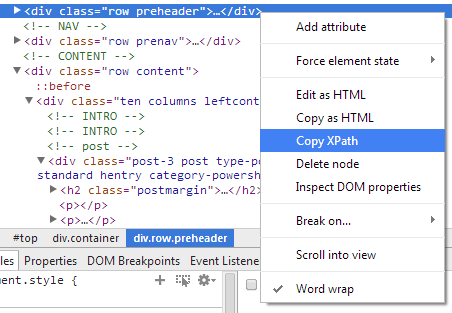 While working with the Chrome Developer Tool I’ve discovered that you can retrieve the XPath of a selected node. It’ll return something like: //*[@id=”top”]/div/div. The $x function can be used to get the element node. But… it only work in Chrome. So what about other browsers? What about jQuery? What about querying documents that resulted from an AJAX request? Now Chrome has a Copy CSS Path option. That expression can be used by jQuery without any problems.